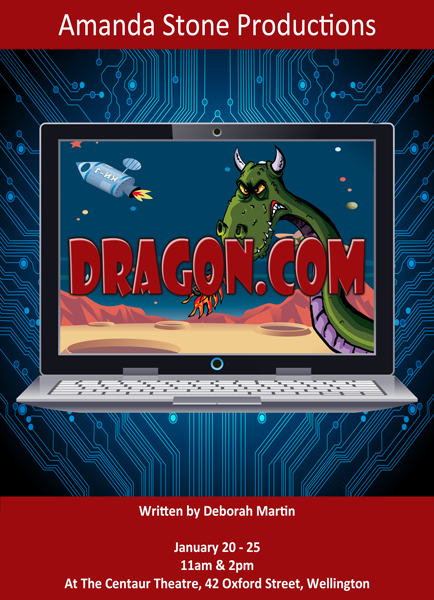 Join four unwitting kids as they journey through cyberspace and into the mediaeval world of Girthop in Dragon.com, a fun show of techno fantasy. With a terrific storyline packed with lots of humour, this show is sure to be a hit with the audience. Featuring 9 great songs, 11 lead roles, loads of supporting parts and plenty of chorus groups, everyone will be able to find a part suitable for them no matter their age group. The Kingdom of Girthop itself can be portrayed as a tradition fairy tale mediaeval kingdom or, alternatively, as a place with a more futuristic bent in keeping with the technological themes of the show. The kingdom itself features 6 locations that can be represented by simple painted backdrops or by performing in front of the curtain with accompanying props. Dragon.com creates the opportunity for children to study myths and legends, famous explorers and journeys as well as the internet and the impact that it has on the way we communicate. Four kids surfing the net end up on an adventure into cyberspace where guides known as Web Surfers show them the way through this maze of technology and into an exciting site known as Dragon.com. This site is the home to the Kingdom of Girthop which is under attack from a frightening, fire breathing dragon. The kids are enlisted to assist the kingdom's leader, Bibo, to lead the inaugural Royal Dragon Hunting Squad. Accompanied by the very reluctant royal troops, they travel throughout the kingdom looking for the dragon. Along the way they meet all sorts of strange characters like the Forest Fiends. When things become too scary, they opt to escape by trying to find a link to a friendlier site but this ends in disaster as they are arrested for blocking the information super highway at peak hour. When they return to Dragon.com they find that the Kingdom Fire Authority has put out the dragon! The real mystery of the dragon is finally revealed and the kingdom celebrates the dragon's demise with a colourful dragon parade! Dragon.com can be performed with a smaller cast of 25 - 30 or by a very big cast with large groups involved in each song and dance number. The show consists primarily of 8 key story scenes and each of these scenes can be performed by a different grade or group. Within each part of the show there are small speaking parts for individual children. Each of the groups (citizens, royal troops, fire fighters, fiends etc.) move off to make way for the next group while action continues with the lead characters upstage. The speaking roles and cameo roles (Dr. Frip, the librarian etc.) can be played by children within each group or by a core group of older children who appear in each scene playing these different parts. The four lead roles belong to that of the kids who find themselves in cyberspace. These roles should be performed by confident actors who are able to bring out the personality of the characters. These roles also require the performers to sing in a number of different musical numbers. The rest of the speaking roles are more of a supporting nature but are no less important to the show. Harry is a computer whiz, Simon's a smart aleck, Kelly acts like a princess and Stephanie is anxious but can sometimes be feisty too. Bibo is the self-promoting Queen of Girthop with a big personality who sings two solos during the show. The Web Guru acts as a disinterested guide to the 4 kids and appears throughout the show. Also featured are Lod and Tipi, Tark, the fire chief, the Fiendmeister and more. There are 9 chorus groups who perform relevant songs during pivotal scenes during the show. These groups can vary in size to support the number of actors that are available.